"Great web site. Nice, easy online experience." The ESPIA EPZ, Falken�s latest addition to the winter tire line up. It provides superb traction even in the harshest weather conditions. Specially designed canyon sipes and a fiberglass reinforced rubber compound allow the EPZ to �claw� the roughness of ice and stubbornness of snow in a non-studded alternative to the traditional winter tire. The new ESPIA EPZ is the perfect choice capable of conquering Mother Nature at her worst. Offering both an ice face and snow face,� through a Falken-patented dual tread pattern, which provides for a wider center tread and expanded lateral shoulder area grooves, improving overall grip on snow and ice. Siping inside the block is composed of complex zigzag bodies which are angled and deep to allow the tread to flex and grab additional traction in every winter condition. An antiaging agent continues to seep from the base tread to fight ultra violet rays, as well as repeated bending. 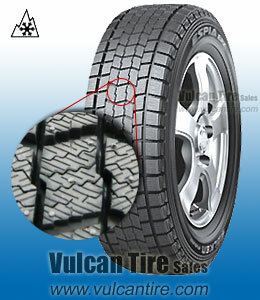 This enables the tire to work better, by controlling aging and maintaining the fundamental functions of a tire. The new tire offers a longer life, better stability and stronger performance than previous studless tires. Provides a stronger resistance to wandering which encourages a confident and consistent driving experience. These tires are excellent!I am completely satisfied with their performance. The price was good too. These tires are worth every dollar I paid for them. I live in upstate NY where we deal with snow, sleet,freezing rain,and rain, all in the same day. These tires handled it all without any problems. I drive 90 miles a day, round trip to work, and these tires deffinately took some of the worry out of my trip.